Let’s be blunt and up front, this show is about music. There is very little if any romance development. I don’t say that to downplay the show, but if you are not into classical musical at all and find it boring, this show will completely bore you. Having said that, I actually enjoy classical music. That isn’t to say I listen to it on a regular basis, but I do enjoy going to the occasional concert and seeing a live performance. I also have a few friends who play classical music concerts and I have been to some of their practices as well as performances so I have a small amount of inside information to the going-ons behind the scenes. Enough to be impressed by this show. It was evident they actually put some research into this or at-least had somebody help them who was knowledge about such things. For example, I have watched other Anime shows where music is a piece of it and had to shake my head at how poorly it was done. Watching people play guitar or drums where their on-screen actions are clearly not even close to the sound being produced is just pitiful. It shows how little effort was actually put into the scene, and often the show as a whole. Sound! 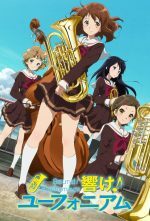 Euphonium was not this kind of show. The actions on the instruments reflected the sound produced. I will admit that somebody who plays one of those instruments for a living would probably disagree and point out all the technical flaws, but at the very least when the characters move their fingers the sound pitch changes and vice-versa. That is a vast improvement over most Anime shows that include musical instruments. This of course completely pisses everybody off and they start calling him a terrible teacher. The show itself kind of follows the course they set and both the students and teacher learning how to learn and grow together as a team. That is pretty much the story. Learning how to play instruments, learning how to not give up when things get tough, learning how to work together even if you don’t like somebody. As I said there is really no romance or any other kind of side story. I am sure this makes it sound like a dull show, and again if you are not interested in classical music at all then this is for sure not the show for you. If on the other hand you have at least an appreciation for classical music and the effort that goes into putting on a great performance then you might enjoy this show as much as I did. In the process, you might actually learn something new about all those instruments and the sounds they make. The writer did put some effort and time into helping you understand the different instruments. Not a deep understanding, but just enough to give you a greater appreciation for the difficulty people go through to play those instruments.